Having the best knitting needles for blankets is crucial. This article covers everything you need to know about what knitting needles to use, including what size you need, what to know before you buy them in a store, and reviews of the top needles. I do most of my blanket knitting by hand, rather than with a knitting machine. This poses a challenge when selecting knitting needles. Over the years, I’ve done a lot of research about the best knitting needles for blankets. 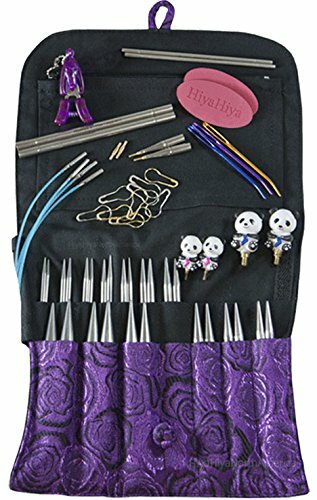 I’ve tried several brands and styles of needles, and found that some work better than others. I’ve learned that, while picking the incorrect yarn weight and fiber is a cause of frustrating and failed blankets, the correct needle is a greater contributing factor than people realize. Let’s begin by talking about what you should be looking for in knitting needles. The best knitting needles for blankets will hold all of your stitches, but still bear the bulk of the blanket’s weight so your hands and wrists won’t hurt. Constantly holding the weight on your hands and wrists causes pain and fatigue, because you’re carrying the blanket’s weight as you knit each stitch – eventually, your joints and muscles ache, causing you to knit slower with uneven tension. Several factors can cause your hands and wrists to bear the blanket’s weight, so different needles will be best-suited for different projects. Whether you are knitting a blanket in one piece or in sections to sew together later, as well as the size and type of needle you use, will play a role in determining what type of knitting needle your blanket needs. As mentioned above, I knit a lot of blankets. I’ve found that using the right knitting needle is extremely important for easily knitting blankets. Blankets can be made with a variety of knitting needles, but I want to go over why a circular needle works and why you should use it. A circular needle is two needles connected by a long cord. The cord carries the weight of the blanket, which means your hands and wrists will not suffer from fatigue, aches and pains, like happens with straight needles. As a bonus, the cord allows all of the stitches to fit on the needle so you don’t have to worry about stitches falling off or being too cramped to fit the needle into the stitch. The really important part, though, is to make sure the cord is the right length for your blanket. What About Interchangeable Circular vs Fixed Circular Needles? Choosing between interchangeable and fixed needles can be challenging. Fixed circular needles have the cord permanently attached to the needles. They come in different lengths, depending on the length of the cord. The most common lengths used are 16”, 24”, 32”, and 40”. These needles work well for knitting blankets. However, unless you always knit the same blanket with the same yarn, you’ll need to buy a different needle for each blanket you make. This can get expensive and create storage issues for all the needles you buy. Interchangeable circular needles allow you to remove the needle tips from the cord. You can change the needle size easily, going up or down, by simply attaching a different tip. You can also change the length of the cord by connecting two or more cords together. 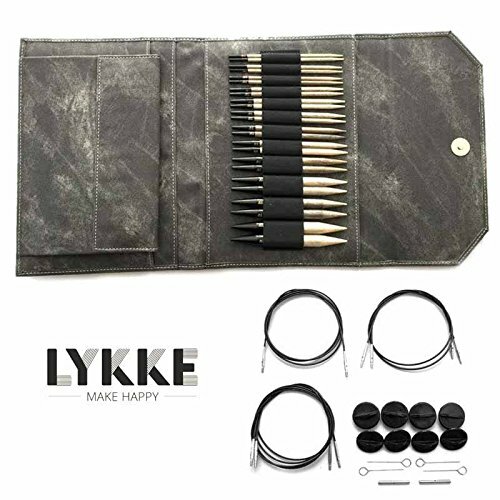 Interchangeable needles come in sets with multiple cord lengths and multiple needle tip sizes, allowing you to mix and match them to create the length and size you need for each project. I like to use interchangeable circular knitting needles for blankets. After I start a blanket, if I find that the stitches are too cramped or my hands and wrists are starting to bother me, I can change the cord length by connecting another cord! What Needle Size do You Need to Knit a Blanket? Blankets can be knit with a variety of needle sizes. Ultimately, the needle size you need will depend on the yarn weight you use, and the type of blanket you make. For example, larger yarn weights need larger needles. Lace blankets, while made with a smaller yarn weight, require larger needles to create the lacy pattern. The best way to know what needle size you need is to check your pattern (if you’re using one) or the label on your yarn for the suggested needle size. The bigger the needles and yarn, the faster you will be able to knit a blanket. That’s why bulky or super bulky yarn weights are the best for fast blankets to knit. With so many products on the market, it can be hard to know which one will suit your needs best. Based on my research, these are my top four picks for the best knitting needles for blankets on the market today. This is one of the higher priced interchangeable knitting needles, but tip and cord sizes are great for knitting a variety of blankets with just about any kind of yarn. For example, the 12 tip sizes (US 3-15) and 5 cord sizes (16”, 24”, 29”, 36” and 48”), allow you to create 60 circular needle combinations. I highly recommend these needles for blankets. Especially if your hands or wrists tend to get sore and tired, the bamboo used for these needles is very lightweight and warms to the touch. The tips and cords screw together easily, allowing for fast size changes. But the joins (where the cord and needle tips screw together) are smooth so your yarn won’t snag. Like all bamboo and wooden needles, these do grip yarn a bit which can cause for slower knitting. However, it also decreases stitches slipping off needles, which can be beneficial to beginners or anyone who doesn’t want to accidentally drop stitches. This limited edition set has 13 pairs of tips in US sizes 2-15 and 4 cables in 18”, 24”, 32”, and 42” lengths. This means they work well for most yarn weights – lace to super bulky. In fact, I’ve found they knit an heirloom lace blanket as well as a heavy afghan. The cables swivel while knitting which prevents them from curling, twisting, and getting in the way. The stainless steel needle tips allow stitches to move quickly so that you can knit faster. These stainless steel needles allow for fast knitting. But best of all, the memory-free cord doesn’t twist, kink or curl! There are 13 needle tip sizes (US 2-15) and 3 cords (24”, 32” and 40”). The cable connectors make it easy to combine cords to create queen and king sized blankets. The pointed tips work well for lace blankets. The joins are smooth, allowing yarn to slide easily. Similar to the Clover Takumi, these needles allow for 60 combinations. The 12 needle tips are sized US 4-17. There are 5 cords – 2 are 24”, 2 are 32”, and 1 is 40”. Connectors allow for additional cord lengths. These knitting needles work fairly well for blankets, especially heavier ones as the tip sizes are used for fine (aka sport) to super bulky yarn, and some jumbo yarns too. However, they may not work as well for smaller yarns. The wood warms in your hands, giving comfort to tired and sore muscles. But it grabs yarns a bit causing knitting to be slower, while minimizing dropped stitches. 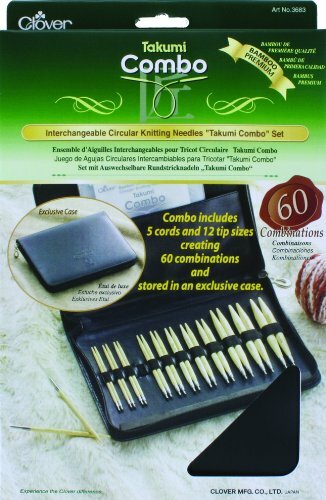 My choice for the top knitting needle for blankets is the Clover Takumi 3683 Combo Interchangeable Needle set. 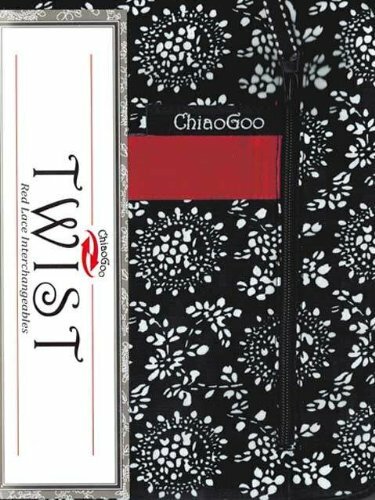 It has a great variety of needle tip and cord sizes, allowing you to create 60 different combinations – for whatever size and style of blanket you knit. The bamboo needle tips help with hand aches and fatigue from the many long hours that go into making a blanket. Stitches slide smoothly over joins, and the bamboo holds the yarn just enough to minimize dropped stitches. In fact, you can’t go wrong with any of the needles I mentioned above. But with the Clover Takumi’s high quality and wide range of sizes, it’s my pick for the best knitting needles for blankets.